I’m going to be making a lot of our Christmas decorations this year. Last year we barely bothered, Mikey was only a year old so wasn’t particularly interested. We put up some lights and that was about it, we didn’t even get a tree. Here’s the first thing that I’ve made, a mobile. It’s made from cardboard, kitchen foil, transparent thread and a twig from one of the trees outside. Just things that were lying around the house. Want to know how to make your own? Cardboard, mine was from a recycled mailing box. Transparent thread, although you could use any kind of thread or even some ribbon or twine if you have it. Twig, mine was about the length of my forearm. Take your cardboard and roughly draw a whole lot of stars on it, they don’t need to be neat and tidy unless you want them that way. Cut them out. 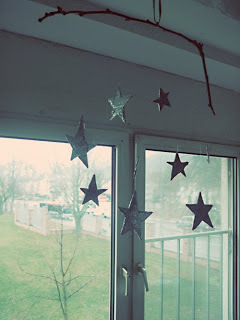 Spread out a sheet of foil, scrunch it up a little if you want your stars to look wrinkled. Apply glue to one side of a star and press it down onto the foil. Cut around it, leaving the foil between the points of the stars, you’ll need this to fold over the edges. Cut a line down the middle between the points of the stars. Apply glue to the side of the star legs which does not have foil and fold the spare foil over. Repeat this on the opposite side until the entire star is covered with foil. Repeat for all stars. When your glue is dried you need to attach your stars to the twig. I tried to space them out a little so that they were different heights, but it’s up to you. Tie one end of the thread to the twig and then measure (eyeball) how long you want it to be and cut. Tape the thread to one of your stars. Repeat for all stars, being careful not to tangle them. To hang, tie a ribbon or some thread to the middle of the twig. Make sure it will hang fairly straight where you’ve tied it, My twig was a little heavier on one side so I had to move my ribbon along. Then you tie a loop in the ribbon and hang it somewhere! I’m totally pleased with how mine turned out, when I got the idea I only half expected it to look good! When they’re hung in a window they reflect the light beautifully. These instructions of course aren’t set in stone, play around with them and think of different ideas. You could add glitter, or instead of using a twig you could hang them on something circular. 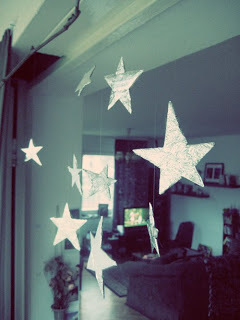 You could add silver ribbon to each star to make them look like shooting stars. Anything you want, it’s your Makeshift Christmas! Tutorial by Satakieli. You can find her blog at Clash and Contradiction. She asks if you decide to make this, let me know her how it goes by leaving a comment here! She’ll link to all the pictures she’s given. I think I might do this with the kids, but make magen david instead of regular stars :-) I think they'll have fun! That is so cute and sounds like it wouldn't be too difficult either! Maybe the kids and I will try it this weekend, if we can take time away from studying for exams! Ack!